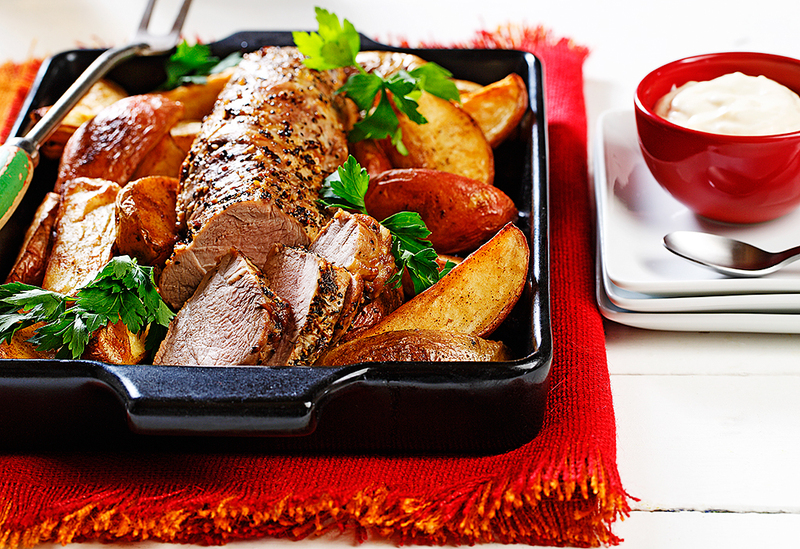 The meat and potatoes in this zesty dish never tasted so good! 1. Preheat oven to 425F (220). Cover baking sheet with foil. 2. Heat canola oil in a large nonstick skillet over medium high heat. 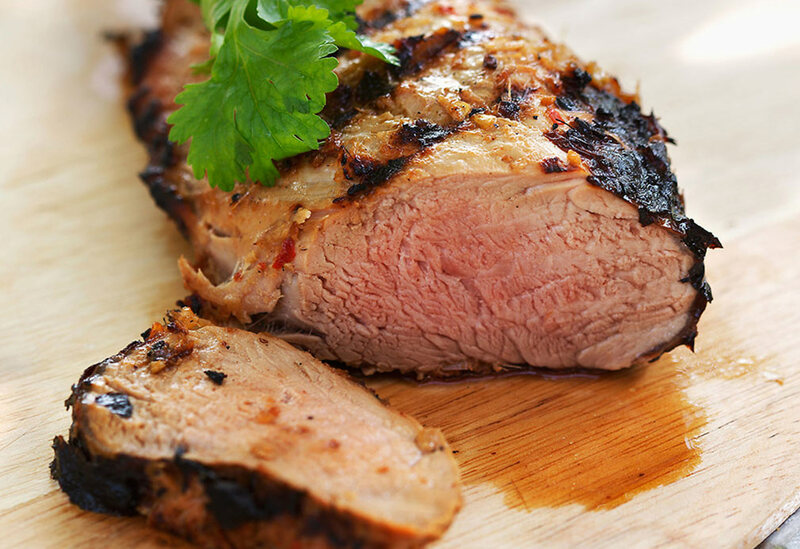 Sprinkle pork tenderloin with seasoning blend and 1/4 tsp (1 mL) salt. Cook 3 minutes, turn, and cook 2 more minutes. Place pork on the prepared baking sheet. 3. Add potatoes to skillet, and sprinkle with paprika. Toss to coat, preferably with a heat resistant rubber spatula, and cook for 1 minute. Place potatoes around pork, and roast for 18-20 minutes or until a meat thermometer inserted into thickest part of meat registers 160F (325C). 4. Meanwhile, combine sour cream, canola mayonnaise, water, horseradish, and Dijon mustard in a small bowl. 5. Place pork on the cutting board and let stand 5 minutes before slicing. Pull sides of foil up around potatoes, seal foil, and let stand. Slice pork and place on a serving platter. Sprinkle remaining 1/4 tsp (1 mL) salt over potatoes, and place potatoes around pork with any accumulated juices. Serve with sour cream mixture. Flavorful Tip: Tossing the cut potatoes in paprika and the pan residue adds a rich brown, glistening color to the potatoes. 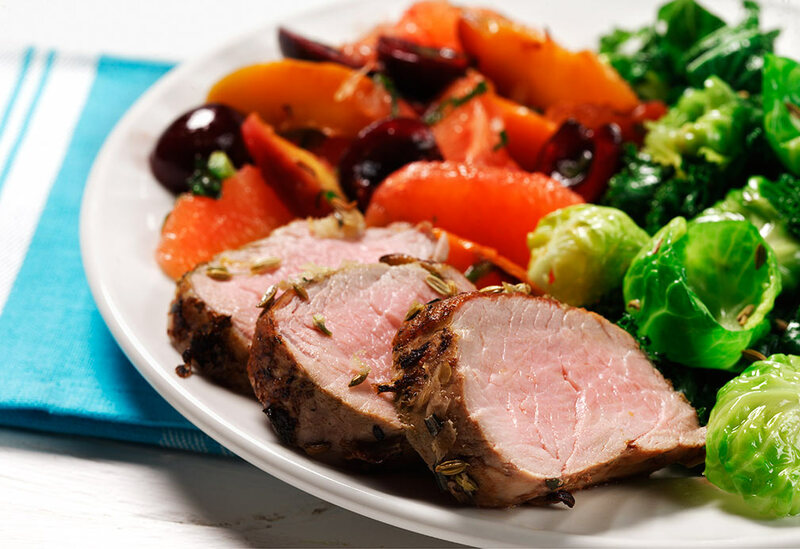 Canola oil infused with lemon and rosemary offers a touch of herb flavouring to both the fruit compote and pork tenderloin. Greens mixed with Brussels sprout leaves are heightened by a splash of grapefruit juice and fennel seeds to convert any said hater of this misunderstood sprout. Lemongrass is an amazing aromatic herb that tastes of fresh lemon and limes. 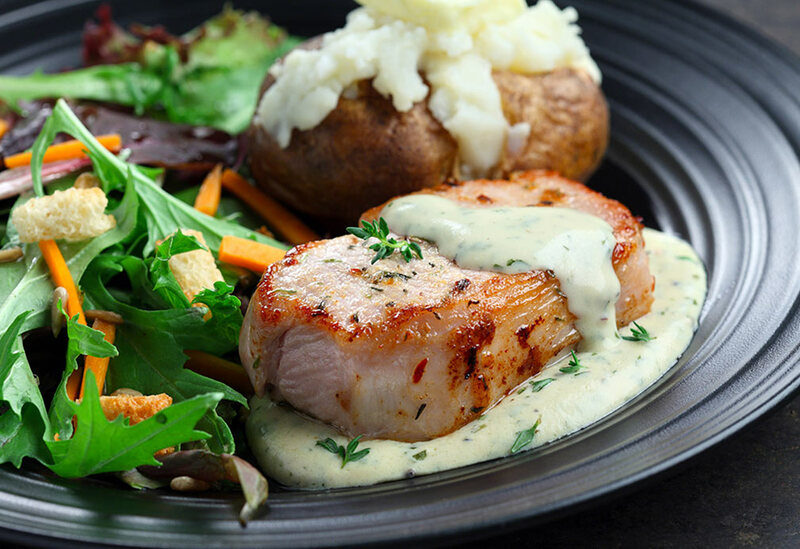 Kick your pork chops up a notch with this tasty mustard sauce!